Ford Motor Company engineers have come up with a new inflatable bicycle design that allows the bike to deflate and fit in the boot storage of a car. Only the bicycle’s frame can deflate, keeping the seat, pedals, chain, handlebars and wheels a traditional design. The frame is made up of seven rubber tubes connected together by valves. These valves allow the air to flow throughout the structure to inflate and keep it rigid while in use. The rubber tubes connecting the seat and back wheel can get adjusted to change the frame’s suspension. 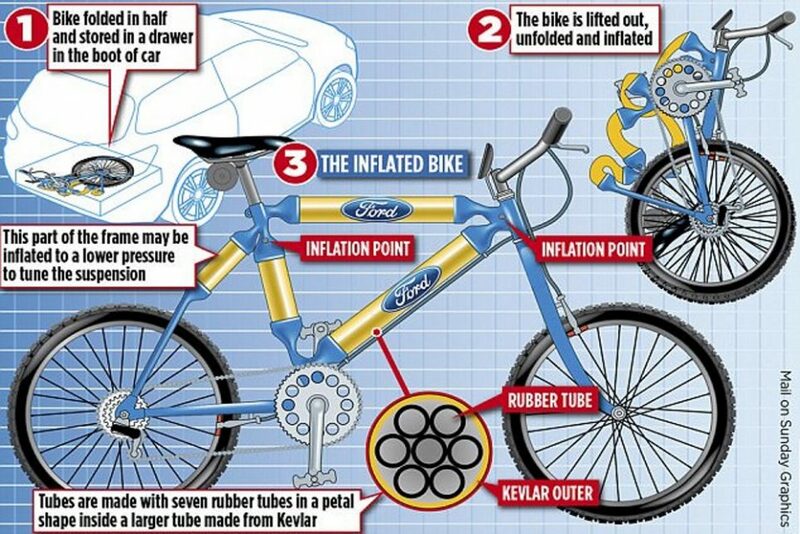 With an inflatable bicycle structure, a customer would worry about it getting easily punctured, but Ford’s engineers ensure this won’t happen as the rubber tubes were designed with Kevlar sheath, making it difficult for the frame to get cut and the material also helps in supporting the weight of a cyclist. Ford submitted these plans for a patent, which also include an air pump in the vehicle.